Flame grilled smoked Brinjals (Baingan in Hindi) are used in many ways in Indian kitchens. Earlier the brinjals were grilled in charcoal or wood fire but since we use gas stoves with flame it is easy to grill the brinjals over gas flame. 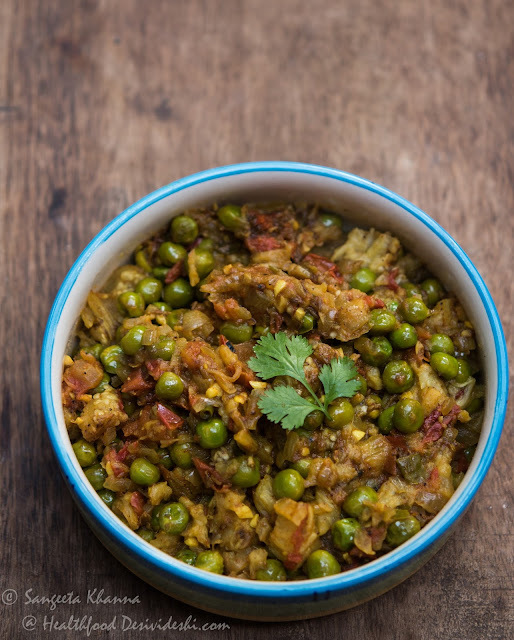 We regularly make baingan ka bharta during winters when green peas can be added generously to the bharta while baingan chokha is made when one wants a light meal. 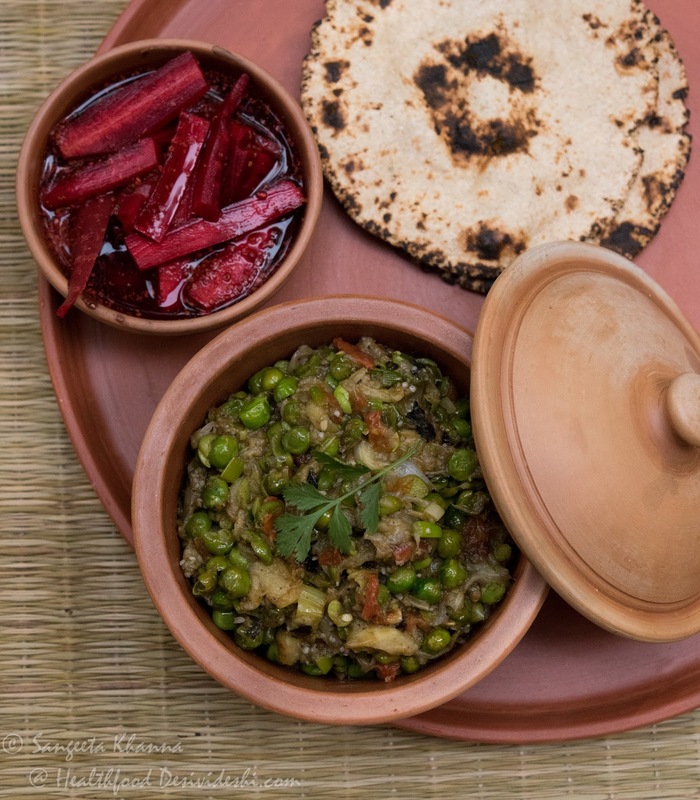 Both baingan ka bharta and baingan ka chokha are low fat subzi dishes and a great way to increase one's vegetable intake. Fat free or low fat vegetable dishes are very well suited if other components of your meal are heavier on fats or you have been prescribed to avoid fats. For me it is for a detox sometimes and to compensate a paratha craving some other times. Bharta tastes great with Parathas and ghee soaked Bajre ki roti or even Litti (unleavened baked buns)..
Heat ghee in a nonstick pan ( I use my cast iron skillet), add hing and jeera and let it splutter. Then add in the onions, ginger, garlic, green chillies, all finely chopped and stir fry till translucent. Now add in the powder masalas and salt to taste. Mix well and then add in the chopped tomatoes immediately to save the powder masalas from burning. Cover and cook till the tomatoes are completely mashed, stirring in between. Now add in the boiled peas and the grilled and mashed brinjal. Mix well and keep frying till well blended. Serve hot garnished with chopped green coriander. brinjal one medium, roasted on the gas flame or boiled as above. Roasting and boiling both impart different flavours, I do it both ways as time allows me. All the other ingredients are to be added raw while making baingan ka chokha. 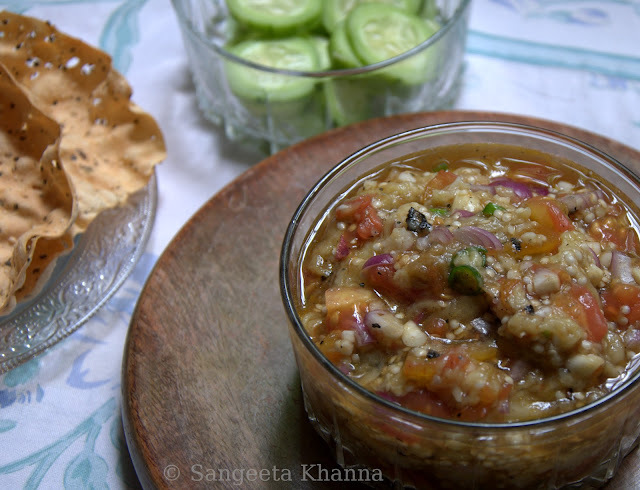 The brinjals cannot be microwaved for this recipe, as the creamy and juicy texture is lost in microwaving them. tomatoes remain quite juicy when microwaved in a covered bowl, of course after making cuts in it. Mix all the ingredients together and make a homogeneous mixture. It can be served hot or cold. You can add a boiled potato and mash along with the grilled brinjal and tomatoes. The taste is delicious with a slightly thick mixed cereal roti, bajra roti or litti. I prefer it with generous amounts of ginger garlic and green chillies as I like spicy food. It is a must try for those who are on a weight loss regime. Oh yes it tastes great with daal chawal too. Actually in uttar pradesh, daal bhat chokha is a desi frugal meal and I find it quite amazing in taste as well as like a light and quick meal. I often think that if we start eating this kind of poor man's diet (it is one of them in UP) there will not be any weight gain problem in the modern world. baingan ka bharta baingan ka chokha eggplants everyday subzi/curry for the dieters for diabetics these foods helped me loose wt.